Cuddalore is a city which is the headquarters of the Cuddalore District in the south Indian state of Tamil Nadu. Scholars believe the name Cuddalore is derived from Koodalur, meaning confluence in Tamil. While the early history of Cuddalore remains unclear, the town first rose to prominence during the reign of Pallavas and Medieval Cholas. After the fall of Cholas, the town was ruled by various dynasties like Pandyas, Vijayanagar Empire, Madurai Nayaks, Thanjavur Nayaks, Thajavur Marathas, Tipu Sultan, French and the British Empire. Cuddalore was the scene of Seven Years' War and the Battle of Cuddalore in 1758 between the French and British. It has been a part of independent India since 1947. During the 2004 Indian Ocean earthquake, Cuddalore was one of the affected towns, with 572 casualties. Apart from fishing and port related industries, Cuddalore houses chemical, pharmacological and energy industries in SIPCOT, an industrial estate set up by the state government. The town is administered by a special-grade municipality covering an area of 27.69 km2 (10.69 sq mi) and had a population of 173,676 in 2011. Cuddalore is a part of the Cuddalore legislative assembly constituency which is a part of the Cuddalore Lok Sabha constituency. There are nine schools, two arts and science colleges and two engineering colleges in the town. There is one government hospital, six municipal maternity homes and 37 other private hospitals that take care of the healthcare needs of the citizens. Roadways are the major means of transportation, while the town also has rail connectivity. The nearest airport is Chennai International Airport, located 200 km (120 mi) away from the town. 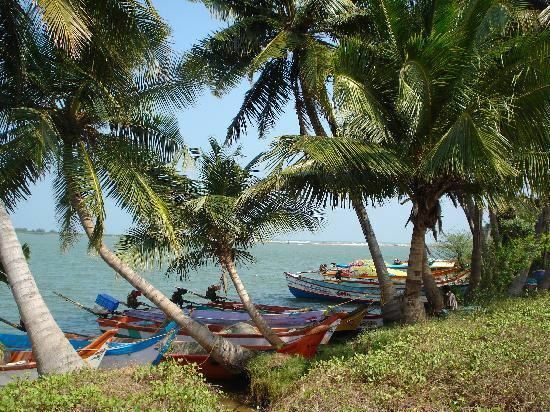 The nearest major seaport is Karaikal port, located 100 km (62 mi) away from the town. Prior to English control, Cuddalore was called "Koodalur" meaning "confluence" in Tamil. It is the place where the Pennaiyar, Kedilam, Paravanar and Uppanaar rivers join. The Cuddalore district historically consisted of "Chola Naadu" and "Nadu Naadu". The name Nadu Naadu meaning "middle country", may originate from its location between Chola Nadu and "Thondai Mandalam"; or between the "Pallava Kingdom" and the "Chola Kingdom"; or between central territories and the ocean. From ancient times the old town has been a seaport. For two centuries, Cuddalore had been subject to a number of foreign powers including the Netherlands, Portugal, France and more recently, the British. In the early 17th century, the Dutch obtained permission from the ruler of Cuddalore to build a fort there, but political pressure from their Portuguese rivals forced them to abandon it. Later, the French and English came to Cuddalore for trade and business. The French established a settlement 10 miles up the coast at Pondicherry in 1674, followed in 1690 by the British settlement of Fort St. David at Cuddalore. During the 18th century various wars between the European powers spilled over to their colonial empires, and to their allies, including those in the Indian sub-continent. During this period the French and British fought several times in the area. In 1746, during First Carnatic War, part of the War of the Austrian Succession, French forces besieged the British at Fort St. David for several months before being driven off in 1747. In 1758, during the Seven Years' War, the Fort was taken by the French, and there was an inconclusive naval action, the Battle of Cuddalore, off the coast. The fort was later abandoned, in 1760, when the British attacked Pondicherry. In 1782, during the Second Anglo-Mysore War, at the time of the American War of Independence, the French again took Cuddalore, and were besieged there in 1783 by the British. 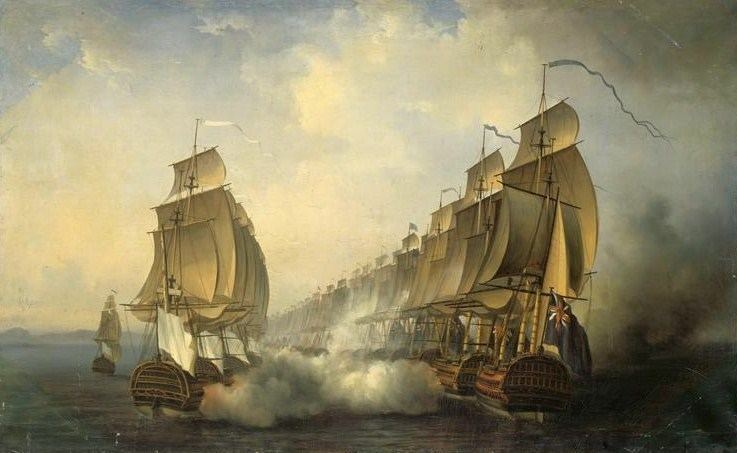 During the siege French and British naval forces again clashed off the Cuddalore coast. The siege failed, but the fort was returned to the British in 1795. In all there were five different naval actions off the coast during this period, all of which were indecisive. Cuddalore is located at 11.75°N 79.75°E﻿ / 11.75; 79.75. It has an average elevation of 6 m (20 ft). The land is completely flat with large deposits of black and alluvial soil inland and coarse sand near the seashore. The sandstone deposits in the town are popular. The Pennayar River runs north of the town, while Gadilam River runs across it. Cuddalore is situated at a distance of 200 km (120 mi) from the state capital Chennai and 18 km (11 mi) from Puducherry, the neighbouring union territory. The nearest airport is at Chennai, 200 kilometres (120 mi) from Cuddalore. Recently, an airport has been put into function at Puducherry, 15kms approximately from Cuddalore , with flights connecting two important cities, Chennai and Bengaluru. The period from November to February in Cuddalore is pleasant, with a climate full of warm days and cool nights. The onset of summer is from March, with the mercury reaching its peak by the end of May and June. The average temperatures range from 37 °C (99 °F) in January to 22.5 °C (72.5 °F) in May and June. Summer rains are sparse and the first monsoon, the South-West monsoon, sets in June and continues till September. North-East monsoon sets in October and continues till January. The rainfall during South-West monsoon period is much lower than that of North-East monsoon. The average rainfall is 1,400 mm (55 in), most of which is contributed by the North-East monsoon. Cuddalore experiences a tropical wet and dry climate under the Köppen climate classification. In Tamil Nadu Cuddalore witnessing heavy rainfall in every northeast monsoon. The highest 24-hour rainfall recorded in Cuddalore was 570 mm on May 18, 1943. One of the Oldest railway station in Southern Railway. First Railway Track was proposed at 1857 from Walaja Road to Cuddalore via Tiruvannamalai. There are frequent buses to nearby towns like Pondicherry, Chidambaram, Panruti, Virudhachalam, Tindivanam and Viluppuram. Buses to major cities of Tamil Nadu such as Chennai, Tiruchirapalli, Coimbatore, Salem, Kallakkurichi, Tiruvannamalai, Vellore, are also available. TNSTC, the state run bus service operates long distance buses to various cities in the state like Madurai, Theni, Palani, Theni, Coimbatore, Tiruppur and Hosur. KSRTC operates daily buses to Bangalore from Cuddalore. Being a coastal town, historically, Cuddalore's main industry was fishing. Although Cuddalore was once a port town, the shipping trade has now moved to larger centres. Cuddalore also hosts the heavy chemical, pharmacological and energy industries in SIPCOT, an industrial estate set up by the state government. The National Thermal Power Corporation (NTPC) and Tamil Nadu Electricity Board (TNEB) planned to commence power plants around the town. The industrial development in Cuddalore's recent past has resulted in pollution. SIPCOT, the major industrial area in the town is a "global toxic hotspot" Local communities have voiced concern about industrialization and pollution. The SIPCOT chemical industry estate in Cuddalore was investigated in November 2002 by a team from the Indian People's Tribunal headed by J. Kanakaraj. The team reported "a noticeable stench of chemicals in the air". The report published in July 2003 reported that "Villages like Kudikadu, Thaikal, Eachangadu and Sonnanchavadi lie in a virtual 'gas chamber' surrounded on three sides by chemical factories and bounded on the fourth by the river". There are reports of illegal dumping of toxic waste. On 22 March 2008, a report for the "Tamil Nadu Pollution Board" prepared by the Nagpur-based "National Environmental Engineering Research Institute" found that residents of the SIPCOT area of Cuddalore were at least 2000 times more likely than their counterparts to contract cancer in their lifetimes due to exposure to high levels of toxic gases from chemical industries in the region. There are a total of more than ten schools including both matriculation and CBSE in Cuddalore. The town has three arts and science colleges, namely Periyar Arts College, St. Joseph Arts & Science College and C. Kandasamy Naidu College for Women (KNC). There are two engineering colleges in the town, namely, Krishnasamy Memorial Engineering College and Jayaram Engineering College. Krishnasamy Memorial Polytechnic and Padaleeswarar Polytechnic are the two polytechnic college in the town. There are six Industrial Training Institutes (ITI) in the town, two of which are operated by the government. The Cuddalore municipality was established in 1866 during British times as a revenue village. It was promoted to a selection-grade municipal municipality in 1991 and special grade in 2008. The municipality has 45 wards and there is an elected councillor for each of those wards. The functions of the municipality are devolved into six departments: general administration/personnel, Engineering, Revenue, Public Health, city planning and Information Technology (IT). All these departments are under the control of a Municipal Commissioner who is the executive head. The legislative powers are vested in a body of 45 members, one each from the 45 wards. The legislative body is headed by an elected Chairperson assisted by a Deputy Chairperson. Cuddalore comes under the Cuddalore assembly constituency and it elects a member to the Tamil Nadu Legislative Assembly once every five years. From the 1977 elections, the assembly seat was won by Dravida Munnetra Kazhagam (DMK) five times during the 1980, 1989, 1996, 2001 and 2006 elections, the Indian National Congress party two times during the 1984 and 1991 elections and the All India Anna Dravida Munnetra Kazhagam (ADMK) twice during the 1997 and 2011 elections. The current MLA of the constituency is M.C. Sampath from ADMK. During the 2009 general elections, Cuddalore was a part of Cuddalore (Lok Sabha constituency) that had the following six assembly segments. Tittakudi (SC), Vridhachalam, Neyveli, Cuddalore, Panruti and Kurinjipadi. Before 2009, Cuddalore Lok Sabha constituency composed of the following assembly segments:Ulundurpet (SC), Nellikkuppam, Cuddalore, Panruti, Rishivandinam and Sankarapuram. The Lok Sabha seat has been held by the Indian National Congress for eight terms during 1951–56, 1971–77, 1977–80. 1980–84, 1984–1989, 1989–91, 1991–96, and 2009–present, Dravida Munnetra Kazhagam for four times during 1962–1967, 1967–71, 1999-04, and 2004–09, Anna Dravida Munnetra Kazhagam twice during 1998–99 and 2014, Tamil Maanila Congress once during 1996-2001 and an independent during 1957–62, The current Member of Parliament from the constituency is A. Arunmozhithevan from the AIADMK. Law and order in the town in maintained by the Cuddalore sub division of the Tamil Nadu Police headed by a deputy superintendent (DSP). There are four police stations in the town located in NT, Thirupapuliyur, Cuddalore OT and Cuddalore Port. There are special units like prohibition enforcement, district crime, social justice and human rights, district crime records and special branch that operate at the district level police division headed by a Superintendent of Police (SP). Pichavaram, which is 58 km from Cuddalore, a world-renowned mangrove forest. Pataleeswarar Temple, a Hindu temple, built during the 7th century and dated a millennium earlier, is the most prominent landmark in Cuddalore. The name, Thirupathipuliyur, is associated with the legend behind the temple. The temple is revered in the verses of 7th-century Saiva saints Appar and Tirugnanasambandar in their works in Tevaram. Fort St David, situated on the River Gadilam near Devanampattinam and acquired in 1653 AD by Elihu Yale, a Christian slave-trader and cruel slave master, is one of the most visited tourist attraction in Cuddalore. The wealth embezzled and extracted by him was infused into the famed Yale University, an Ivy League university in USA. Only two decades later, in 1677, when Shivaji captured Gingee, the fort fell into the hands of the Marathas. In 1690, the British East India Company purchased the fort and the adjacent villages (within "ye randome shott of a piece of ordnance".) A great gun was fired to different points of the compass and all the country within its range, including the town of Cuddalore, passed into the possession of the English. The villages thus obtained are called "cannon ball villages". The fortifications were strengthened in 1693, 1698, 1702, 1725, 1740 and 1745. In 1746 Fort St. David became the British headquarters for British India. The British ruled a greater part of south India (Tamil Nadu, parts of present-day Andhra Pradesh, Kerala and Karnataka) from Fort St. David. An attack by Dupleix was successfully repulsed. In 1756, Clive was appointed governor. The French captured the fort in 1758 but in 1760 relinquished it to Sir Eyre Coote of the British East India Company. The French recaptured the fort in 1782 and held it in 1783 during the Battle of Cuddalore. In 1785 the fort passed into British possession. By this time, however, the centre of British rule was Fort St George.